"The queen passed a very comfortable night the 21st of October. She felt some slight pain on awakening, but this did not prevent her from bathing; the pain continued, but to no great extent. Until noon I gave no order for the shooting I was to do at Sacle. Between twelve and half-past the pain became greater; the queen went to bed, and just one hour and a quarter later, by my watch, she gave birth to a boy. 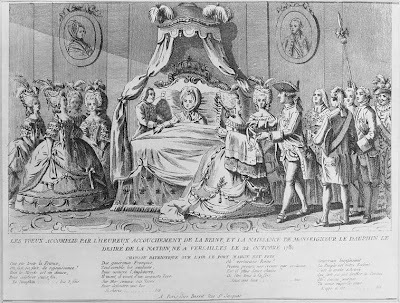 There were present only Madame de Lamballe, the Comte d'Artois, my aunts, Madame de Chimay, Madame de Mailly, Madame d'Ossun, Madame de Tavannes, and Madame de Guemenee, who went alternately into the Salon de la Paix, which had been left empty. In the large cabinet was my household, that of the queen and the grand entries, and the under-governesses, who entered at the critical moment and who remained at the rear of the chamber so as not to cut off the air. Of all the princes to whom Madame de Lamballe sent at noon to announce the news. Monsieur le Due d' Orleans alone arrived before the critical moment (he was hunting at Fausse Repose). He remained in the chamber or in the Salon de la Paix. Monsieur de Conde, Monsieur de Penthievre, Monsieur le Due de Chartres, Madame la Duchesse de Chartres, Madame la Princesse de Conty, and Mademoiselle de Conde arrived also; Monsieur le Due de Bourbon in the evening, and Monsieur le Prince de Conty the next day. The following day the queen saw all these in turn. My son was carried into the large cabinet, where I went to see him dressed, and I laid him in the hands of Madame de Guemenee, the governess. After the queen had been delivered I told her that it was a boy, and he was brought to her bedside." Although the entry is written in his concise and factual manner, you can nevertheless feel his pride and joy for the birth of his son and heir, can't you?